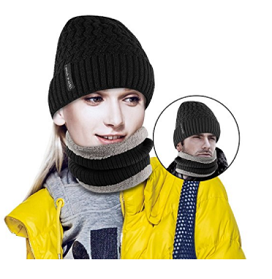 This perfect hat and scarf are fully lined with superior acrylic knit and thicker fleece lining, which is great for autumn, winter and outdoor activities. Gender: Unisex for men and women. Size information: Hat Circumference: 22-23.6"(56-60cm), Height: 10.2"(26cm); Circle Scarf Circumference:19.7-27.6"(50-70cm), Height: 8.7"(22cm). We would love to see you wearing our hat neck warmer set, so please share your pictures here or send them to our email! problems about the quality of the item, just feel free to contact our customer service. We will reply you within 24 hours and give you a satisfied solution.